The League for Municipal Improvement is often identified as the organization that campaigned for and facilitated the improvements of Harrisburg’s City Beautiful Movement. Yet, there was another group of prominent men, women, and businesses, who were not all members of the League, who pledged donations to fund prominent national experts to draw up plans for improvement. 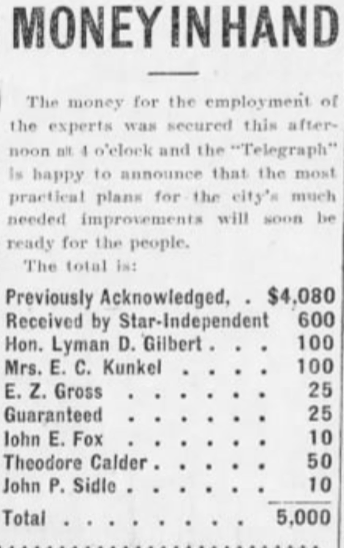 In May 1901, the Telegraph and the Star-Independent ran a series of articles over the course of a week listing individuals and businesses, their donations that totaled $5000, and their sentiments about improvements. Over the next couple weeks, I will be shedding light on many of these men and women who envisioned a better city and devoted their resources to the cause. In order to prepare for the daunting project our Digital History class spent some time analyzing the population numbers in the city of Harrisburg for the year 1900. We utilized programs such as Microsoft Excel and Microsoft Access which aid in the process of analyzing numerical and textual data through the use of spreadsheets. Microsoft Access is a remarkable tool that enables a user to create tables and formulate queries. This excerpt is from The Telegraph newspaper in Harrisburg. It shows the amount each individual donated. The Telegraph released 5 of these lists over a two week period. Before analyzing the data, I undertook the task of utilizing information provided in The Harrisburg Telegraph which listed the names of the donors. Each individual and company are listed with the dollar amount of their donation.The newspaper published a list of donors over a one week period. I was able to get the names of many of the donors to this momentous project, and the exact amount they donated. Also, I cross-referenced this information with the Harrisburg census data from 1900. The census data contains key information such as the addresses and wards where each donor resided. From this plethora of information, I will create a detailed database that will shed light on the significance of the donations. Microsoft Access is a remarkable tool that enables a user to enter a spreadsheet and formulate queries. The next step to analyzing the donation money is to create a spreadsheet through Microsoft Access which can be analyzed to answer specific questions. An example of a question that can be answered with the spreadsheet is which donors lived near each other and did this have an effect on how their wards voted? However, I am still compiling the data needed to accurately answer these questions. 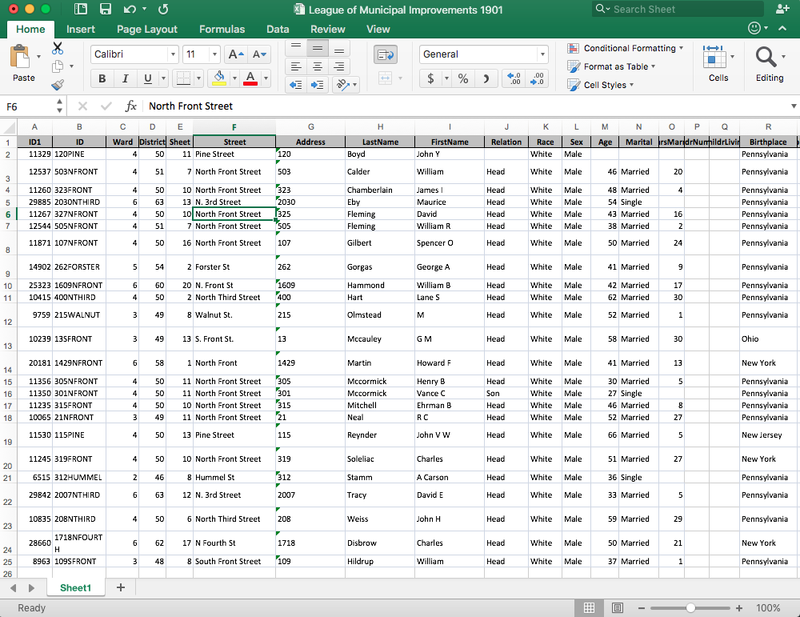 This is a screenshot of the Microsoft Excel spreadsheet I am compiling of the donors. Through my observations of the Microsoft Excel spreadsheet, one commonality stood out to me. Of the 36 donors that I compiled into this spreadsheet, four were members of the Market Street Presbyterian Church. Although this seems like a small number, it makes up 11% of the donors. I plan on searching deeper into the church membership to see if the member’s Christian beliefs played a role in the donation to the communal project of improving Harrisburg for the people of the city.